Cook the bacon according to package directions. Cut the bacon slices in half and let them cool. Heat the white chocolate pieces in the microwave for 1 minute, stir, then heat for 1 more minute. Brush or spoon the melted chocolate over the cooled pieces of bacon. Very lightly sprinkle some coarse salt, Hawaiian Red Sea Salt of something similar, over the chocolate. Place the coated pieces of bacon on parchment paper or wax paper to let the chocolate dry. Heat the chocolate chips in the microwave for 1 minute, stir, then heat for 1 more minute. Add a few drops of vegetable oil to the melted chocolate chips – just enough to thin out the chocolate. 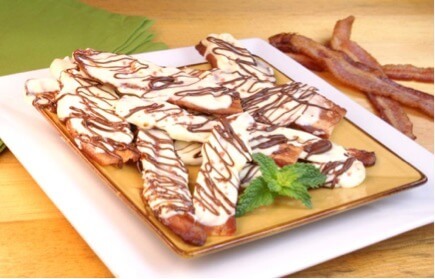 Drizzle the melted semi sweet chocolate over the white chocolate coated bacon. Let the chocolate dry before eating the product.